Working as a cat and kitten rescuer in SoCal is hard work. The busy streets and freeways are dangerous for stray or loose cats. Female cats can have litters of kittens for a longer period of time, extending way beyond summer, due to the mild weather. It’s a hard, and often thankless, job keeping up with all felines who need help. 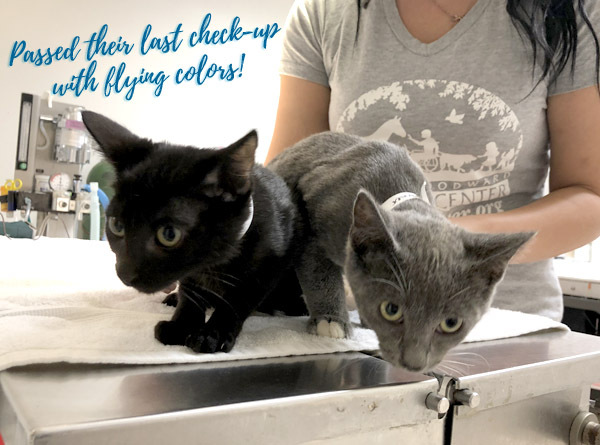 On one day, in late July, one of our rescue partners working in Los Angeles County got a call regarding kittens who needed help. 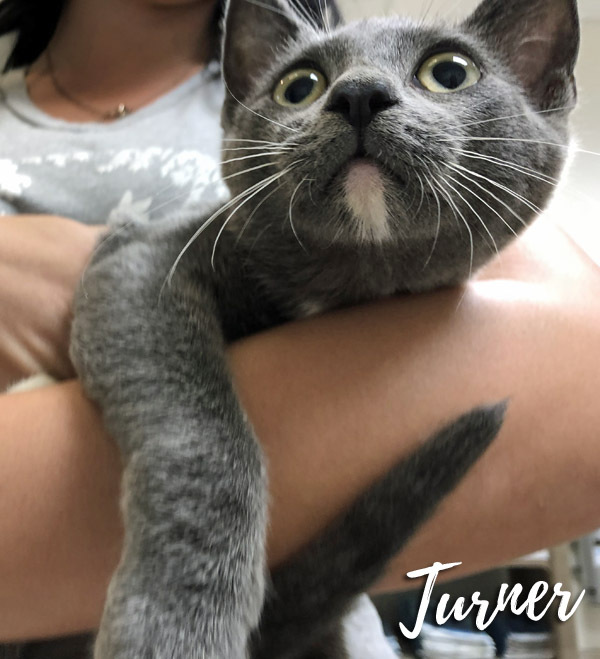 This particular rescue partner traps cats and kittens and gets them spayed or neutered, to prevent more cats having litters. She receives a lot of calls for help. However, on this day, the veteran cat rescuer was not prepared for what she saw. 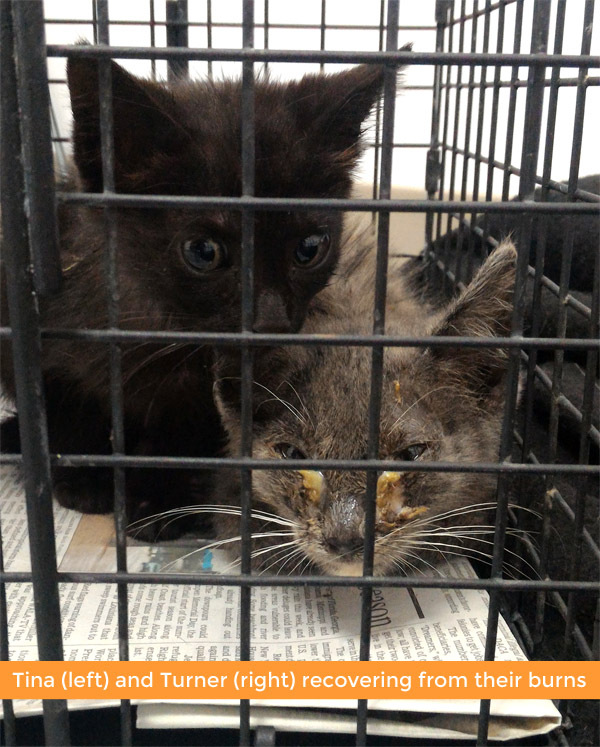 When the cat rescuer arrived to the area where loose kittens had been spotted, she was shocked and saddened. 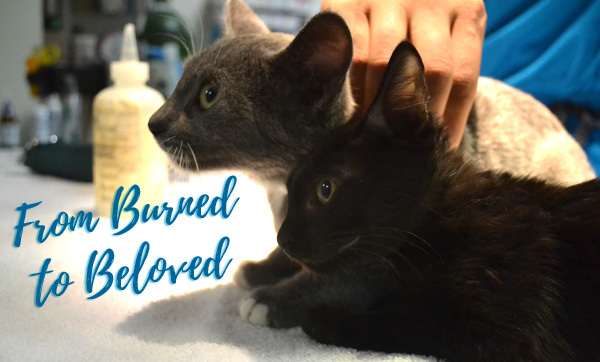 Two kittens, one black and one gray, were crawling on the hot cement in obvious misery. 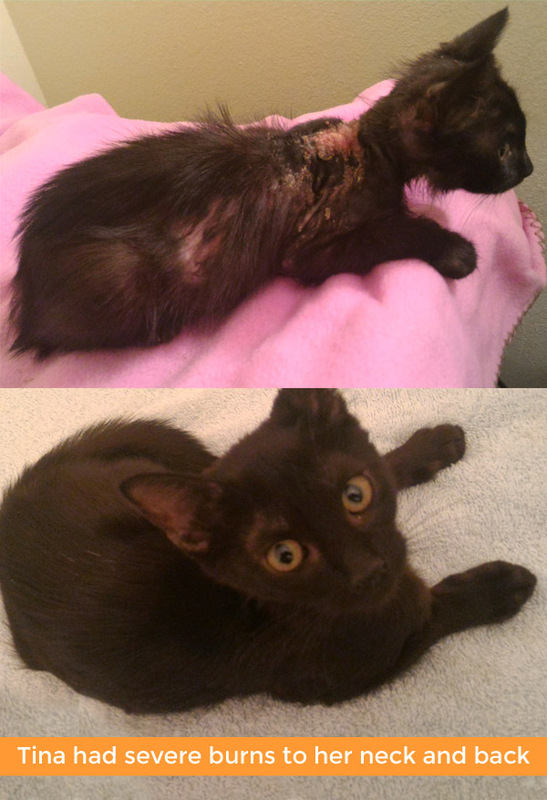 Both kittens had missing patches of fur and the skin underneath was inflamed and raw. Their eyes were so thick with discharge, they could barely move from where they had been crouching. The cat rescuer gently lifted the two suffering kittens into a crate and rushed off to find a veterinarian. They had been burned, horribly burned, but by what was anyone’s guess. The burns could have been from a heat source, such as a fire or a hot surface, or even by chemicals. Was someone leaving out caustic chemicals that the kittens were somehow getting into? 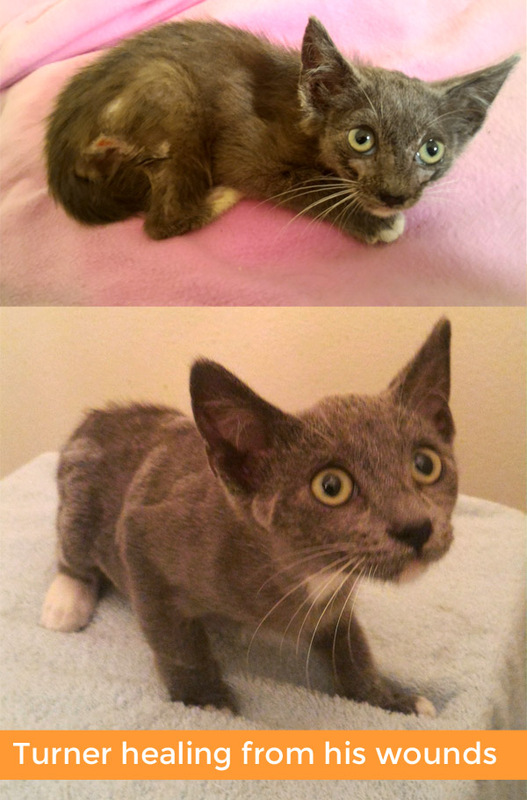 For a month and a half the kittens received soothing ointments, medicated baths and antibiotics to help them recover from their burns. They were also given names: Tina (the black kitty is a girl) and Turner (the gray kitten is a boy). We don’t know if they are related to one another, but one thing is certain, they have become fast friends! The love from their rescuers and care-givers, and the love they have for each other, helped them get through this terrible ordeal. And that’s what love’s got to do with it! Today, you wouldn’t even know Tina and Turner had been burned at all! 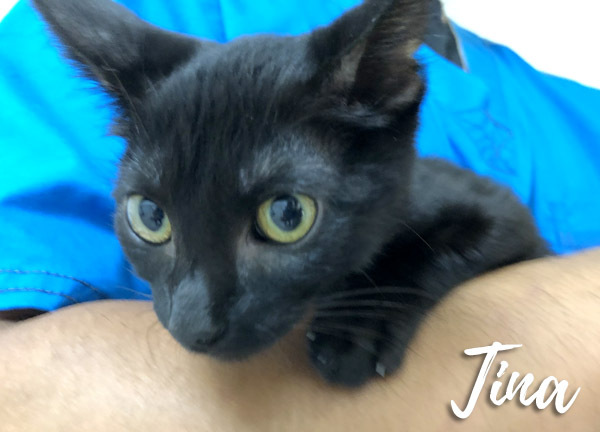 Their fur is glossy and gorgeous, their skin is healthy, and they are ready to find forever love with a family who will cherish them. Meet them at Cat Adoption page!